Day 1 – Arrive in Belfast. We spend the night in the city. DAY 2 – Saturday. North Down. Cultra foreshore (Permian red-bed sediments). Donaghadee (Sil – Ord greywackes with sedimentary structures). Newtownards lead mines (historical, mineralogical and environmental interest). At one time Irelands largest lead mine, the area is now a Country Park with engine houses, chimney stacks and spoil heaps in which galena, chalcopyrite, baryte and other minerals can be found. Lead-rich tailings have an interesting effect on the flora and erosion by motorbike scramblers is spreading tailings into adjacent field. Scrabo Country Park (Triassic sandstone with Tertiary dykes/sills. Overnight in Belfast’s Jury’s Inn. DAY 3 – Sunday East Antrim. Coastal localities from Larne to Murlough Bay (Devonian through Cretaceous sedimentary sequence, Tertiary basaltic lavas and volcanic plugs). Larne, ‘Fish for Tea’ fish teeth on coastal section at Larne, however these are small, only 1-2mm therefore difficult to spot. Pecten shell moulds are more easily found on the foreshore. Irish Chalk and landslips. Wadis at Cushindall (coarse conglomerates), Carboniferous plants at Ballycastle. Possibility of collecting contact metasomatic minerals which produce calc-silicate minerals such as Scawtite and Lameite, if we have time. Finish up at Ballycastle. Overnight at The Adair Arms Hotel, Ballymena. DAY 4 – Monday North Antrim. Coastal localities from Ballycastle to Portrush. Continue travelling along the northern coastline of Northern Ireland taking up where we left the day before. 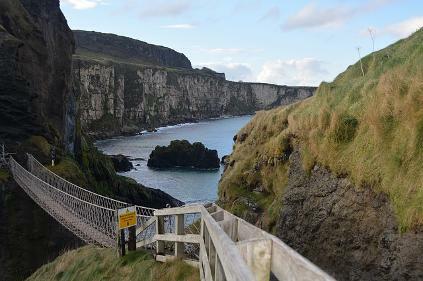 Giant’s Causeway and Carrick-a Rede (Rope bridge, not for the faint hearted and subject to seasonal opening hours). Portrush has a sill intruded into the clays giving backed margins etc. Also Ammonites and Porcellanite fossils. Schauwt Hill, contact metasomatic minerals where igneous plug within chalk produced specialist calcsilicate minerals such as Scawtite and Lameite, (rare minerals, possible collections). Overnight at The Adair Arms Hotel, Ballymena. DAY 5 – Tuesday Sperrin Mountains. Inland localities (Dalradian metasediments, Ordovician volcanics, Quaternary glacial and fluvioglacial features). Gold panning. Possibly a visit to the Omagh Minerals Ltd., office near Omagh. Possible visit to the Cavanacall trench which has gold mineralisation. The trench is now weathered at the surface, however, the sulphide bearing rocks can be found with some hammering. Cashel Rock close to road and stockwork veins. Overnight in Omagh, Silver Birch Hotel. DAY 6 – Wednesday Fermanagh and Leitrim. Tour of the Marble Arch Caves (includes underground boat trip) and fossil hunting at Lough Allen (Carboniferous limestones), pyratised fossils, fossils on foreshore of lake. Overnight at Jurys Inn Belfast. DAY 7 - Thursday. Belfast. Free time to visit the visit the geology and mineral displays in the Ulster Museum. Departure.